Now here is the most interesting point – it can do it ANY time of the year. Winter, Spring, Summer, or Autumn you can always find something to do. Always! All those I said I love can be done in a Jeep. I personally don’t enjoy running my YJ through a mud pit as much as others for one ­simple reason – I hate cleaning that mud out from every cavity you can possibly imagine that vehicle has. But do the same thing in the snow and it is totally different ballgame – it’s a clean version of mudding. It would be great to go for a trip in Moab desert or on hit a trail in Colorado (just to mention some). Your imagination is the limit. It just has to be properly prepared and packed. 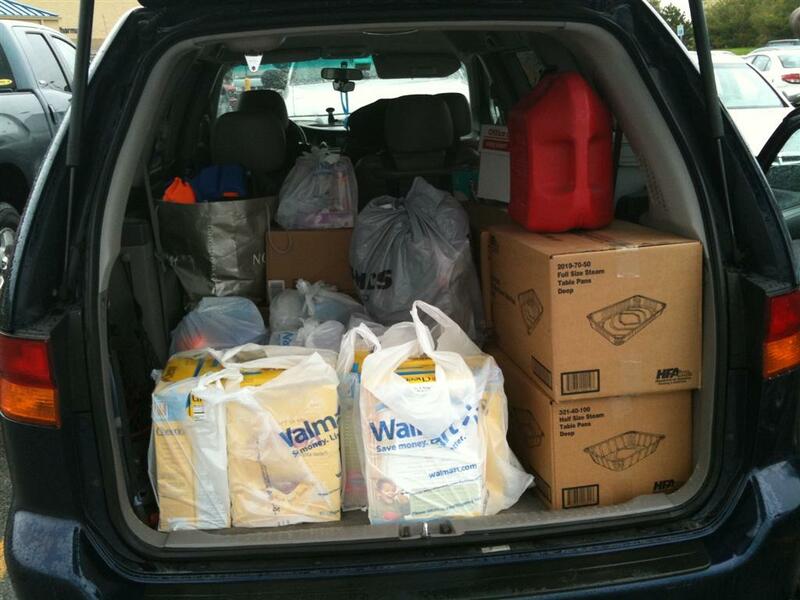 First of all on behalf of Alabama residents we wanted to thank you for your donations we collected over the last week. Special thanks to Handi-Foil (find them on Facebook) for donating four boxes of their products. We came back from our trip to Alabama where we made a small contribution to tornado relief efforts. In the whole honesty, we were leaving Chicago with some feeling of disappointment – Why couldn’t we do more? Despite “don’t you have anything better to do” voices, we emptied our pantry, loaded all donated items, stopped by at the store to buy kids stuff (thanks again for your generous donations) and hit the road. Have you ever had “Don’t ask me why, but I just got to do this” moments? Yeah! That was one of those for me but lets get back on track. Even outside of areas directly hit by tornado, people lived without power for over week driving to the state of Tennessee for gas, charcoal, flash lights, and other necessities (in some cases up to 140 miles one way) and standing 3+ hours to get not more than $25 worth of gas. It is hard to imagine the devastation residents of Birmingham and surrounding areas got to experience, when tornado ripped through the area. Yes, Tuscaloosa got the worst of it, but even outside of Birmingham area there was plenty of damage. We went through Harvest and Huntsville, where according to locals about 5 tornadoes touched down. Two weeks ago that was a convenience store. Here is (below) what’s left of it after tornado crashed it along with lives of two teenage employees. Right across the street there is subdivision where 30 houses got taken out by the same force. But cross the next intersection, and you feel like you woke up from the nightmare. Beautiful landscape, welcoming store signs and every day life make you stop, turn around and remind yourself that what you saw few second ago wasn’t a movie set. There is no door to get back to real life for those folks. That was their real life. Right there. 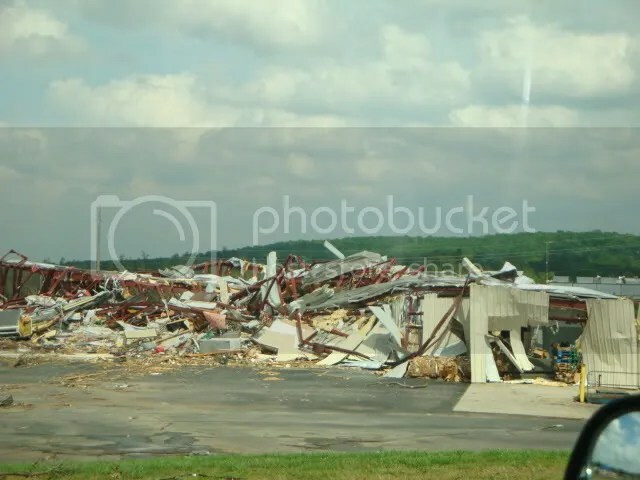 Near by a tornado leveled an Army base and the town by it. Drive another hour in the half and you are in the Birmingham area, where this outbreak took lives of hundreds and left thousands homeless. Something happened to our society over the last century making us used to see horrible pictures of disaster without blinking – destruction of hurricanes Catrina and Wilma, earthquake and tsunami in Japan to name just a few recent ones. We are looking though the pictures we are searching for that OMG!!! shot. Each picture we took left us unsatisfied – it wasn’t good enough and it didn’t show the real damage this tornado did. Here is what didn’t get pictured. Just outside of each photo frame/shut there is pain that didn’t get in that shot. Right behind that rock there is destroyed household, under the fallen tree there is buried sense of security and comfort of so many. That is the time when 70+” screen TV just doesn’t do. People’s faith is tested. Live your life to the fullest. Enjoy every morning and don’t stay mad at anyone for longer than 5 minutes. Even if you don’t believe in higher power, believe in good deeds and helping others. Have a greatest day everybody and thank you all who contributed to our efforts. After reading a report about recent Alabama tornadoes outbreak my jaw dropped. Over 300 casualties alone! It seemed like something out of a movie rather than real life event. However unrealistic it may seem it is real and people need help. Kids are the part of out society the relies on the help of others more than anybody. So, we decided to raise whatever we can and deliver basic necessities like diapers, wipes, water, etc. to Tuscaloosa, AL as soon as possible. Please check out our fundraiser on Facebook and consider helping as little or as much as you can, because every dollar counts. If you’re local (we’re located at 60090) you can drop off kids related consumables, clothes, canned food, bottles (unopened please), sippy cups, and other kids related items for us to deliver. Please contact us directly at ja@jeepalmighty.com. We’re planning to leave on Friday night May 6th with intent to get there the following morning. We’ll have a complete report about the drive after we’re back home. Thank you very much for your compassion. Editorial: Watch for Motorcycles (and Bikes and Peds). – Is Wrangler the safest vehicle on the road? – No and far from the top of the list. – Can I make it safer than it is to satisfy my needs? – Yes. That gave me hope and encouraged to continue with the research. Let’s look at this vehicle line from the very beginning. Willis, the Wrangler’s predecessor and the great grand father of the whole line, was developed as a military vehicle that had a single purpose – get you from point A to point B regardless of the road conditions. So it did. Also, for that reason luxuries (which would not make a long list to begin with) were sacrificed for simplicity. It was made to be easily fixable in case issues arise anywhere, anytime. Without going much into technical part I can tell you that concept hasn’t changed much since then. Today it is probably the most easily modifiable vehicle offered on the market. I often call it a LEGO truck. I’m not referring to lift kits, winches, and other specifically off-road oriented equipment. I’m talking about rollover cages, bumpers, etc. I’m talking about something that would improve overall safety of the vehicle. It brings me back to the point – from the very beginning of this line of vehicles, one thing we can say for sure is that whatever they were designed for does not include being comfortable. At least not as a main objective. One single purpose of it is to make sure that it gets you where you’re going. Period! With that in mind, let’s see if it is safe enough to be a family vehicle in any way. Just by looking at it without bringing in any technical reading I could say that there are some “holes” in safety by my standards: rear seats are too close to the tailgate, with a hardtop installed there are three huge windows right by the rear seats, no headrests for passive safety on the rear seats, limited amount of airbags (YJ’s and models before it didn’t even have any at all), … what else? … high center of gravity which makes the vehicle a likely subject to rollover. These are normally the major points that come up in any discussion about Wranglers and safety. Now, those are serious points but let’s see if and how they can be addressed. It is true that rear seat proximity to the tailgate can be an issue in case of a rear end accident however there are ways to improve the situation. There are numbers of custom bumpers made for these vehicles that can significantly improve the situation. They are much sturdier and more resistant. Moreover, original tailgate has a spare tire mounted on it which would work like a cushion in case of an accident. Some of the custom built solutions have custom tire carrier attached to it primarily because the vehicle has oversized tires installed and the new spare simply wouldn’t fit on the original carrier. Assuming that the spare is a match for those installed that tire provides even greater distance between the seat and the point of first contact in case of a rear end accident. Another practical solution is the insta-trunk. Its original purpose is to create secure, lockable coverage for the rear cargo area for times when it has a soft top or no top. Well, a side affect from that is that you’re adding another resistance point for the tail section. Another big one for me was the fact that with a hard top installed there are three big glass windows located right by the rear seats where kids would normally be sitting. So, the issue is that in case the glass gets hit it’s going to fly in every possible direction inside of that vehicle. The last thing I want to have my kids being cut by pieces of flying glass, so I started thinking. The first thing that came to my mind was the tint film. Considering that most of the old ones and some new ones do not have tinted windows that will come handy anyway but most importantly will keep the shattered glass together for the most part. Absence of headrests is easily fixable. There are numbers of add-on headrests or better yet a whole new rear seat that already comes with two headrests. There are plenty of those to chose from. Different configurations, colors, etc. It surprised me how many I found, so it turned out to be really not that much of an issue after all. Limited amount of airbags was somewhat a disappointment but in all reality of the situation there is not much we can do about it – this is the way it was developed. That is it. However the next point is really interesting and exiting because it addresses not just practical part of Wrangler but also esthetical. How to deal with the high center of gravity? Two words – Big Tires! 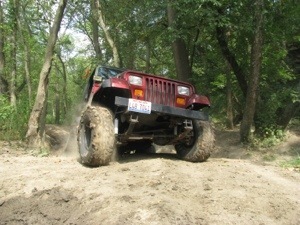 It is not a big news that Wranglers (other than Rubicon) do look dorky on those original wheels. But aside for them being disproportional and dorky looking they also steal from your wheel base. Every extra inch of your wheel base = improved stability of your vehicle. The wider it is the harder it is to roll it over. Not that it’s entirely impossible but you’d have to put a bit more effort to do so. When large tires being used there are few things addressed: your Wrangler does look better; by the a proper combination of rims and tires can increase your total wheel base up to 6” or more depending on the rims and tires. That’s a significant improvement in stability on any terrain. Also, remember that spare tire? It is your safety cushion for the rear seat. There is one more variable in this whole Wrangler safety situation that we have to but really cant account for. I can really say that it is the biggest variable of all that makes the biggest impact. It is the driver. We all have different styles of driving. Some more, some less aggressive but make no mistake, specifics of Wrangler require you to review your driving habits every time before you get behind its steering wheel. It is not a racing car, not a van, etc. It is a truck in any aspect of it and it has to be driven like one – carefully and with respect. It can be a lot of fun if you treat it properly as well as a lot of troubles if you do otherwise. I keep hearing stories about Wranglers rolling over. Well. Look at it this way; when you approach a sharp turn in a van full of passengers, what do you do? … Keep accelerating? Or perhaps slow down to the speed which you can feel comfortable with? Isn’t it how the driving is supposed to be anyways? Wranglers have pretty sturdy rollover cage to protect the passengers that can also be reinforced to make it better. It’s very easy. Some solutions you can install on your own driveway, some solutions have to be installed at a shop. However, no amount of safety features will help you if you do not drive that vehicle appropriately. Every vehicle is different. You do not drive a Toyota Siena the way you drive a Corvette, do you? Wrangler is not different in that respect. It does require you to drive it more defensively. You have to anticipate what’s coming. You can drive it safely with kids or friends in the back seats. Some things have to be changed, adjusted, or added but all together those are just support solutions. The only one who can make a real impact on the situation is the driver. 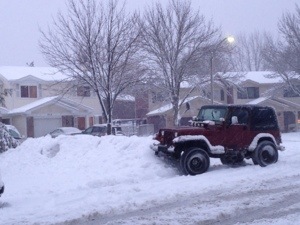 So, after all of those thoughts it did look fairly simple to me – we got a 1995 Jeep Wrangler Rio Grande and every time I jump in it I remember that Wrangler is not the safest vehicle out there and has to be driven with that in mind. Our kids most of the times spend in my wife’s Odyssey to get around town. Wrangler is mostly kept as my daily driver along with my Triumph Sprint RS bike. However, when it comes to going to the great outdoors van stays home. Despite all safety and comfort it provides it is incapable to get where we’re going. Kids do love the view through a huge film tinted (for safety and looks) side windows. They love bumpy ride and no-top option. It is a lot of fun to drive it around town and even more fun to take it off-road. Wrangler has a lot of cons but as many pros, so after all it comes to you as a potential driver to make responsible decisions (now that you more or less understand what you’re dealing with) after you got one in your garage sitting and waiting for a good day to go places and see things others can only see on TV. There are a lot of amazing places we’d love to go to and the plan is to do it in our Wrangler. We as drivers just have to always remember – keep it safe! Win this exciting and dynamic game by Sony Computer Entertainment America. ModNation Racers is a PlayStation 3 exclusive Kart Racing game featuring all the track-based driving and comic combat players cherish in the genre, blended with extreme customization and user generated content expected of a modern online multiplayer title. In it players can expect exceptional kart handling and physics technology, including drifting, jumps and boosting and easy to master customization options covering in-game racers, their karts and the tracks that are raced on. Giveaway is open to USA residents only. Giveaway winner will be chosen via Random.org on Tuesday, April 12th. I will contact the winner via email (if provided) and will post it on our Facebook and blog. Winner will have 48 hours to respond with full name and address. It is your responsibility to leave your email information. www.5minutesformom.com is hosting a Ultimate Blog Party 2011 April 1st-8th 2011. We are new kids on the block, so I an introduction is in order. We are happy parents of two great and very active children. To “aggravate” the situation we are passionate about outdoor activities that by some might be considered as extreme to some extend. Not just backyard outdoor. The woods type of outdoor. Our main transportation for those adventures has been our faithful 1995 Jeep Wrangler which has proven many times to be a very versatile and reliable way to move around in those conditions. We want our kids to have this adventurer’s spirit also, which can let them see in real life things that other people can see only on TV. Things that will blow your mind. We just have to get there. We are looking forward to our Wrangler family season. How about you? The Ultimate Blog Party has been around for a while and this year we decided to enter it. It looks like a great way to meet other bloggers. Please go to the Ultimate Blog Party 2011 page to learn more about it as well as to find out how you can enter for the prizes. Yeah! Prizes! A lot of them! Our contribution to the prize list was a $25 Amazon Gift Card. Check our page on Facebook and lets be friends.